Therefore, in this entry, with specific experience of my first ever trial of using pressure cooker in Africa, I would like to share how to use it and how it functions, as well as some learning out of it. Why did I want to buy a pressure cooker although it is more expensive and heavier (against my general policy) than a normal pot, especially in Africa (Mauritania)? Well, it is due mainly to cooking of Natto in Africa (for more detail, please see Arigato NattoーHow to make Natto at Home Even in Africa). Given that it was the first time and I had so much adrenaline in myself, I did not care about spending 8 hours of cooking soy beans. If I want to continue this Natto making, however, (which I really do), it is not sustainable for the sake of time and economic reason (as I use small gas pomp for the stove). Therefore I was very much interested in the use of pressure cooker, which I heard could save time and money around 8 times. As soon as I got home, I started reading the instruction (which was really brief), but I could not find much detail even on internet (as there is no brand). So I decided to learn how to use it generally with other brands. Honestly I was quite impressed by the diversity of brands and fancy functions (with pressure adjustment and auto-lock function). No matter how rapid products evolve in the market, of course the one I bought did not have any sophisticated function. To start using, put ingredients and water and cook with high heat. It takes longer than normal pots to boil (due to the change of boiling point, about which I will explain shortly). Also the amount of water should not exceed two third of the pot. 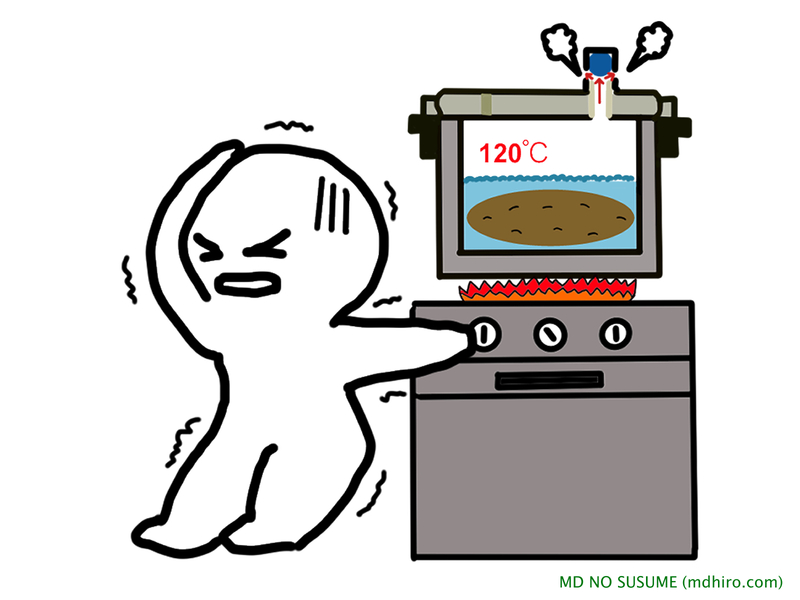 When you finish the pressure stage, turn off the gas to lower the pressure, either by waiting until the pressure gets 0 or pull up the button which controls the pressure and make that “Shu Shuu” sound (but be careful as steam can be very hot). 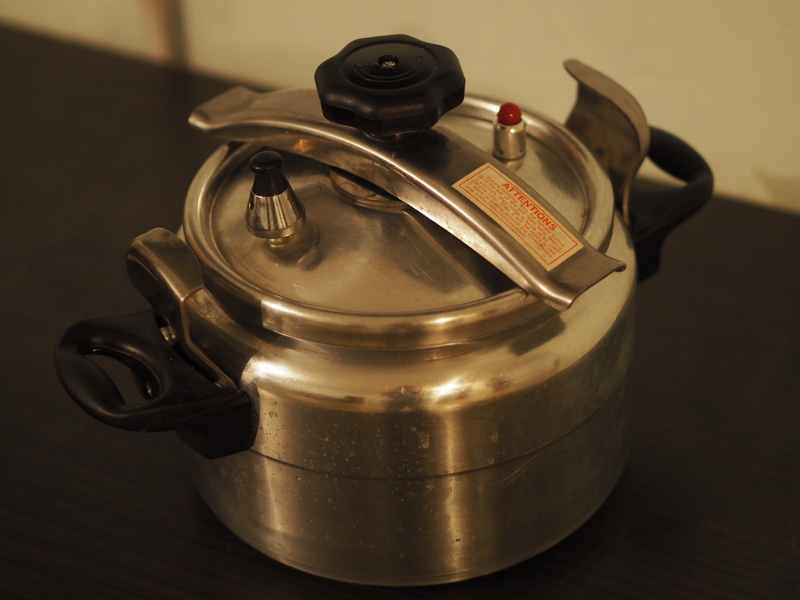 The pressure cooker is useful to cook something which takes longer than 1 hour with normal pot. You can save money and time up to 8-16 times. But why does it make faster? How does it work? Simply put, the high pressure changes the boiling point. As 1 image shows more than 1,000 words, let me start with the below image. In summary, the pressure change the boiling point, and the higher it gets, the faster it cooks. 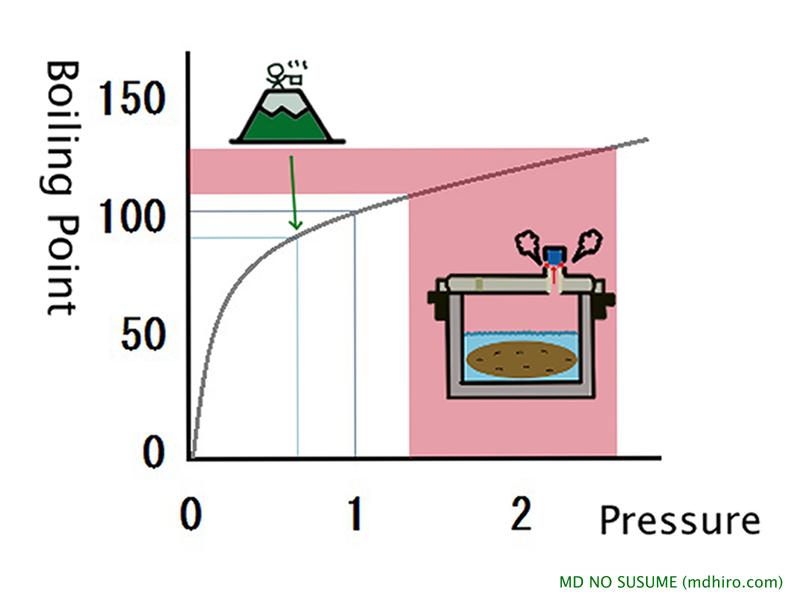 For example, in the regular environment (altitude), where the pressure is 1 in the above table, the boiling point is 100℃. However, on the top of mountain, the pressure gets lower. For example, if you are on the top of the Mt. Fuji and cook rice (pressure 0.6 and the boiling point around 90℃ ), water get evaporated faster than the adequate temperature and it will not cook well. Although the use of pressure cooker could be dangerous and actually it was used for terrorist attacks, as long as you use correctly and pay enough attention, it will not cause any problem. Anyway, it is worth trying at least once. Turn on the stove →1 min later, nothing happens. 5 minutes, still no reaction. Around 10 minutes later, it started making a sound “Shu Shu Shu Shuuuuuuu!” That means it has enough pressure in the pot. And all of a sudden, however, the water started coming out of the pressure cooker! Through the whole process, I also found another life lesson: worrisome and risk → investigation and experiment → trial and error→success. With the advent of technology, it is always difficult to try something unknown as there exists certain risks (in this case of pressure cooker, an explosion and/or physical damage). Thus, we have to search some information to mitigate possible risks and take appropriate measures. If that does not work out, analyze and try again. In the same vein, many people are worried about AI (artificial intelligence) or automatic driving without person, but probably it was the similar feeling when pressure cooker came out in the market for the first time. Well, that was it for some stories and analysis around the pressure cooker. 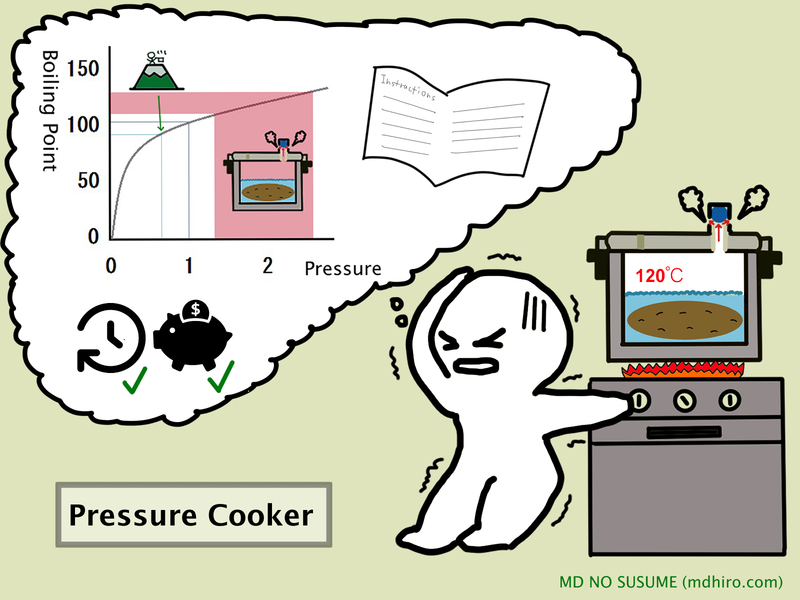 In the next entry, you will see about the continuation of Natto making with pressure cooker. Pressure cooker taught me that if you are aware of what you want, you can find it easier, and doing something new always involves fear and risk, but through research and action, trial and error, you can make it. Thank you for reading. If you like it, please don’t forget to subscribe. If you have any comment/question, please feel free to leave. Have a great learning!